Lebron James warms up wearing an 'I Can't Breathe' t-shirt. The shirts protest a grand jury decision not to indict an NYPD officer in the death of Eric Garner. LEBRON JAMES, WIDELY regarded as the best player in the NBA, joined many of his colleagues in earlier this month in wearing t-shirts emblazoned with the phrase, “I CAN’T BREATHE”, which is reported to be one of the last things Eric Garner ever said. Garner’s death came after he was dragged to the ground and restrained by New York Police Department officers, but a grand jury declined to indict a white officer, triggering waves of protest. Players around the NBA and NFL such as Kobe Bryant, Derrick Rose, and Reggie Bush have worn shirts protesting this and other incidents, such as the shooting death of another young, black, male, Tamir Rice, a 12-year-old shot while playing with a pellet gun. Athletes have sometimes been criticised for failing to use their public positions to promote causes, but decisions like this demonstrate that sometimes sportspeople are willing to take a stand. Below are some of the most prominent instances of athletes standing up for what they believe in. Silver medalist Peter Norman of Australia wore an Olympic Project for Human Rights badge in solidarity. Like Smith and Carlos, Norman was ostracised for his gesture when he returned home. However, history has smiled on their brave stand. In 1967, Ali, the heavyweight champion of the world, refused to be inducted into the US Army because to fight in Vietnam would be contrary to his Muslim faith. He lost his title, was convicted of draft evasion, fined $10,000, and banned from boxing for three years, though he was able to stay out of prison while the case was being appealed. The Supreme Court ultimately overturned his conviction, and his decision, as well as his skill in the ring, ultimately won him admiration around the world. Brendon Alyanbadejo, is not gay, but the former Baltimore Ravens linebacker was brought up to stand up for others. During his career he repeatedly made statements in favour of equal marriage, once prompting Maryland state representative Emmett C. Burns to call on Ravens owner Steve Bisciotti to stop Ayanbadejo from expressing support for equal marriage. Bisciotti wouldn’t, and Ayanbadejo’s efforts received a great deal of support, including from other NFL players. Heading into Sochi 2014, the Winter Olympics were probably more controversial than ever before. Russia’s law banning the promotion of nontraditional sexual relationships came under fire from athletes and activists. The summer before, at the World Athletics Championship in Moscow, Swedish athletes Emma Green Tregaro and Moa Hjelmer painted their nails in rainbow colours to make their feelings on the law transparent. At the games themselves several athletes made their own protests. After one run, gay Dutch snowboarder Cheryl Maas showed the television cameras her glove, covered in rainbows and unicorns – another quiet but powerful gesture. Are there other political stands by athletes that stand out to you? Let us know in the comments. 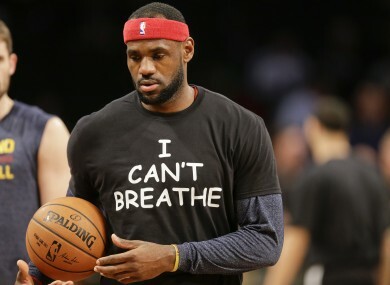 Email “'I Can't Breathe' t-shirts latest in long line of athletes making political statements”. Feedback on “'I Can't Breathe' t-shirts latest in long line of athletes making political statements”.